The Federal Communications Commission (FCC) announced a national 5G auction of large slices (up to 3.4 gigahertz) of the millimeter wave (mmWave) spectrum, along with $20.4 billion in subsidies over 10 years for rural connections, on April 12. The plan ignores expert cyber-security advice, has major security, timing, strategic and financial problems, and will not facilitate new competitors in the telecommunications market. The announcement by President Trump and FCC Chairman Ajit Pai, likely under the influence of telecommunications lobbyists, was a surprise to most experts and took place with no real public input. The auction of the mmWave spectrum is set for December 10. At the press conference announcing the decision, Chairman Pai thanked Director of the National Economic Council Larry Kudlow and Ivanka Trump for their assistance, with Ms. Trump giving a speech in support of the plan. 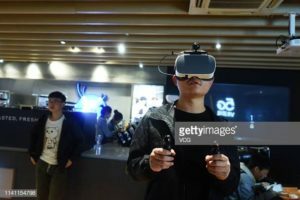 According to Chairman Pai at the April 12 press conference, “We finished our first 5G spectrum auction in January, and we’re holding a second, right now, that has already generated almost $2 billion in bids.” That isn’t much for a North American telecommunications industry expected to reap $294 billion in 2019 revenues. The mmWave part of the spectrum, which is the part Chairman Pai plans to chop up for sale, does allow more connections and higher speeds, compared to sub-6 5G, in high-density areas like stadiums and major urban areas. The mmWave will likely be an important part of the 5G future. However, chopping the mmWave up leads to slower 5G speeds in this potentially ultra-fast part of the 5G spectrum. It is also drawing away attention from sub-6 5G, which requires less infrastructure, start-up costs, and has longer ranges. Virtual division of a unified sub-6 spectrum would yield equivalent speeds, up to several gigabytes per second (Gbps), to the current plan of chopping up the mmWave spectrum. The rest of the world is proceeding down the sub-6 5G path as a first step towards 5G speeds, and will likely only get to ultrafast mmWave 5G (over 20 Gbps, if not chopped apart by auctions) in the more distant future. A focus on mmWave 5G today will make U.S. companies globally uncompetitive in the short and long-run. In the short run, they will be slower in providing broad geographic coverage through sub-6 5G. In the long run, they will be unable to provide ultrafast mmWave speeds because they will have already chopped up that part of the spectrum. The FCC has not advanced a comprehensive plan for 5G, and its hasty auction of three approximately 1.1 Ghz slices of the mmWave to three different companies may constrain future options for ultra-fast mmWave. There are major economies of scale to keeping the 3.4 Ghz total as a single spectrum, which if kept together and divided virtually is faster than spectrum that is divided ex ante. Spectrum sharing, or virtual division, yields faster speeds, given a certain amount of spectrum, than physically divided spectrum as the upcoming FCC auction will require. Virtual division and sale of spectrum is not “nationalization” as its detractors claim, but rather the only way the laws of physics allow us to get the fastest 5G speeds. Virtual spectrum division also has the market-friendly effect of encouraging small businesses and entrepreneurs to innovate and get involved in the 5G competition. Small businesses will be able to afford short-term virtual leases of shared (and therefore ultrafast) 5G spectrum, but will be unable to afford bidding for chunks of a physically chopped up (and therefore slower) 5G spectrum. Dividing up and concentrating on the mmWave has major strategic and practical weaknesses that could undercut U.S. national security. It addition to stifling American competition and innovation by pricing out small business and entrepreneurs, it will distract large American telecommunications companies, like AT&T and Verizon, from the international competition for sub-6 5G, which is longer-range and therefore cheaper from an infrastructure perspective. Telecommunications is also known as telecom or telco. Chinese telecom companies like Huawei and ZTE, which are planning to first supply sub-6 5G services globally, before they enter the more rarefied mmWave space, have adopted the more competitive sequencing strategy. Most global cities will want the cheaper sub-6 5G, which is still blazing fast at several Gbps, before they proceed to the benefits of higher-cost ultra-fast mmWave spectrum at over 20 Gbps. Lastly, an American focus on mmWave 5G will leave U.S. rural customers without effective 5G speeds for upcoming innovations in smart agriculture, like utilization of networked drones. The U.S. plan to provide rural subsidies of $20.4 billion over 10 years is woefully insufficient to bridge the infrastructure gap, which would require hundreds of billions of dollars to get mmWave 5G to all rural Americans. As 5G requires base stations every 200 meters in urban areas, and can only be marginally more spaced out in rural areas, rural mmWave 5G will probably never happen. Utilizing the sub-6 spectrum for 5G would require far fewer base stations, at one every few miles. What then explains this lack of a coherent 5G strategy on the part of President Trump and the FCC? I would argue that they are influenced by the major telecom companies, like Verizon and AT&T, which are seeking an mmWave spectrum giveaway well in advance of demand for such spectrum. Auctioning the mmWave now, when only a few large companies could possibly bid, will drive bids to rock bottom prices. That is essentially giving away this valuable commodity, currently in the hands of taxpayers, without most citizens even realizing what they are losing. This may make sense in order to get telecom support for President Trump in the short-term, but in the long-term it comes at the expense of taxpayers and small telecom companies trying to get into the market but barred by large and unnecessary investments in mmWave infrastructure and spectrum auctions. As such, it rewards countries with more coherent strategies, most importantly China, who will win the global 5G race and as a result have access to all future information flows over global 5G networks. The power that such a future data windfall will give to China cannot be understated. The optimal U.S. 5G strategy is to first clear and unify as much sub-6 spectrum as possible. Second, virtually lease bandwidth on this spectrum to large and small telcos, providing average consumers and companies with several Gbps speeds. And third, virtually lease a unified mmWave spectrum for special use, such as in high density urban areas, and for ultra-fast requirements of over 20 Gbps. Use of current infrastructure for sub-6 spectrum, and shorter term leases of that spectrum, would better allow large telcos to deploy their scarce capital for sub-6 network infrastructure and devices, and facilitate entrepreneurs and small businesses in the telecom space, ultimately creating a quicker and smoother transition to 5G speeds of several Gbps, and more small business competition that would increase innovation and lower costs for American consumers. Shorter-term leases would also get top dollar for use of both sub-6 and mmWave spectrum, which would contribute to taxpayer relief, paying down the national debt, and social and defense expenditures. A quick (over 3 years) international success in the sub-6 5G space would springboard U.S. telcos into the mmWave, which can be achieved in parallel where necessary. 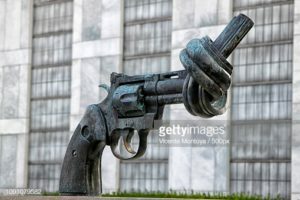 A bronze sculpture titled “Non-Violence” by Swedish artist Carl Fredrik Reuterswärd stands to the north of the United Nations Building in New York. It depicts the knotted barrel of a Colt Python .357 Magnum. Reuterswärd designed the sculpture following the murder of songwriter John Lennon. Credit: Vicente Montoya/Getty. 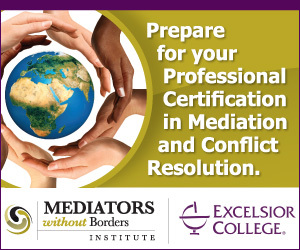 The international system operates across military, economic, and diplomatic hierarchies of states situated in competing alliances and international organizations. The major powers assert the predominance of influence in these alliances and international organizations, leading to a severe and global democratic deficit. Huge numbers of people, most notably the approximately 18% of the world’s population living in China, and 2% of the population living in Russia, have no democratically-appointed representation at the United Nations or influence in the world’s most important alliance systems. The global democratic deficit leads to critical inefficiencies and unfair policies. States use unequal access to military, wealth, and knowledge resources to influence international organizations and alliance systems for individual state gains that lead to global inefficiencies and trade-offs where individual major power goals contradict the public good, or the national interests of other states. Perhaps the most dangerous such inefficiency is the rising risk of nuclear war, as countries like the U.S. and China compete to impose their competing visions of the future on the world. Few Americans have ever heard of “Xinjiang”. Even fewer have ever heard it called by its proper name (the name its oppressed inhabitants use): “East Turkistan”. This strategically-significant region, my ancestral Homeland, is home to an ethnically Turkic, Muslim population of people called the Uyghurs. On official maps, it borders eight countries, but most Uyghurs will count China and Tibet as separate, independent countries and tell you that it borders ten. And therein lies the issue. The vast majority of Uyghurs, like the vast majority of Tibetans, don’t see themselves as part of China. They see China as an occupying force, and rightly so. Up until late 1949 — when the Chinese Communist Party invaded the region and overthrew our government — it was an independent Republic. Most Uyghurs feel no connection to Beijing. Imagine for a moment that the United States Army invaded the Canadian province of Alberta. Surely the residents of Alberta would feel no connection to Washington, D.C.
President Donald Trump’s trade reform campaign is not meant only to redress the massive deficit with the People’s Republic of China ($419 billion in goods last year, a net figure of how much American money is supporting jobs and production in China rather than at home). 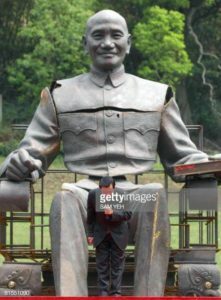 His policies have been rooted in national security concerns with a focus on the dangerous transfer of capital and technology that has empowered Beijing’s military buildup and aggressive behavior along the Pacific Rim and beyond. There is concern that the momentum of his efforts is slowing. He delayed elevating tariffs on Chinese goods from 10% to 25% on March 1st to give negotiations more time to reach a deal. But the PRC regime will never curb its pursuit of the wealth and capabilities it needs to replace the U.S. as the world’s preeminent power. It is a long-term economic contest between rivals for the highest of stakes imaginable. President Trump and close advisors such as Peter Navarro, Director of the National Trade Council in the White House know this, but need to operate from a strong base. Congress cannot, however, add much to the campaign at present. It is so crippled by factions and sophistries as to have taken itself out of the game. But Congress has left a legacy from earlier, less anarchic times: the Defense Production Act. This core legislation, based on preserving the “Arsenal of Democracy” which won World War II, gives the President broad authority to revive, expand and maintain our domestic industrial base. The DPA was first enacted in 1950, but it is still alive and well, being reauthorized twice by President George W. Bush, amended in 2009 on a bipartisan basis, supported by a 2012 Executive Order issued by President Obama and reauthorized again in 2014. An Indian Navy sailor stands guard on the deck of the INS Shivalik during the inauguration of joint naval exercises with the United States and Japan in Chennai on July 10, 2017. 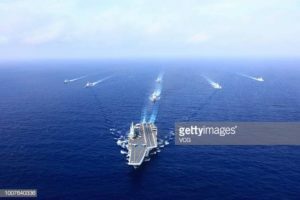 The recent statement by the Commander-in Chief of the US Indo-Pacific Command Admiral Phil Davidson at a press conference in Singapore that the ‘Quad’ or the Quadrilateral Security Dialogue between the USA, Australia, India and Japan may need to be shelved was met with a mixed reaction in the regional maritime security discourse. However, this was not a fatalistic view but rather a tacit acknowledgement of the divergent views amongst the Quad partners on certain fundamental issues. 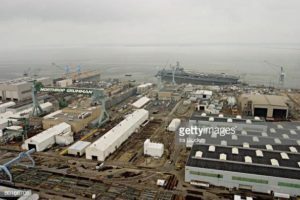 He made this statement based on his discussions with Admiral Sunil Lanba, the Chief of the Indian Navy at the recent Raisina Dialogue in New Delhi where Admiral Lanba said that there was not an immediate potential for the Quad. The idea of a Quad was first articulated by the Japanese Prime Minister Shinzo Abe during the East Asia Summit in 2007; in the same year he spoke of the confluence of the two oceans – the Indian and the Pacific- and introduced the term Indo-Pacific during an address to the Indian Parliament. 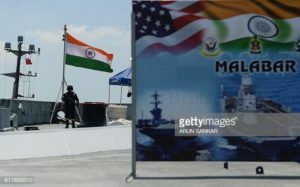 The first attempt to shape the Quad was the decision to enhance Exercise Malabar — the annual bilateral Indo-US naval exercise into a quadrilateral construct. However, China understandably expressed strong reservations about this as an anti-China initiative. Australia succumbed but a trilateral exercise was nevertheless held between the US, Japan and India. For the next decade, while the Quad was spoken of periodically at various fora, very little was actually happening on the ground to give it concrete shape. 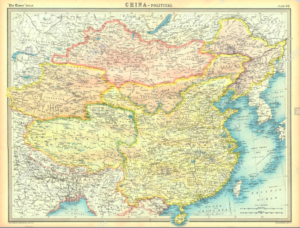 A 1922 map of China. Source: John Bartholomew, The Times Atlas, London, 1922. This article is a slight revision of a talk given on March 25, 2019, in Oxford, England. The associated university is not named at the request of the society’s president, who was concerned about possible repercussions. I would like to thank the Terrorism Research Society (TRS) for kindly hosting this event. The historical map shown here is from 1922, and shows what China looked like when the Chinese Communist Party was founded in 1921 in Shanghai. It shows East Turkestan and Tibet in the west as autonomous regions — much more autonomous than they are today. East Turkestan is now occupied militarily by China and officially called the Xinjiang region of northwestern China. In Chinese, “Xinjiang” means “new frontier”. But Xinjiang has an ancient history as a culturally diverse crossroads of trading on what the Chinese call “the silk road”, but which was was actually more Iranian than Chinese. It was central to the ancient Persian trading areas called the Sogdian network by historians. It has been home to Uyghurs and other Turkic Muslims, to Mongolians, Indians, Greeks, Koreans, Buddhists, and Christians. Since at least the First East Turkestan Republic of 1933 is has been called East Turkestan by Turkic Muslim residents. The Chinese Communist Party in Beijing has indiscriminately labeled Uyghurs who support an independent East Turkestan today, as separatist and terrorist in their goals and means. The acronym of the Chinese Communist Party is the “CCP”. The CCP seeks to colonize and extinguish all linguistic, ethnic and religious diversity in Xinjiang today, in order to assimilate the territory under its own preferred Han Chinese race, and their own atheist communist ideology. 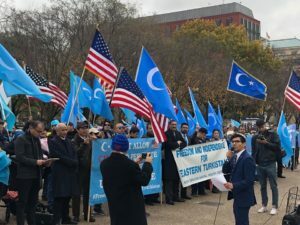 In the face of such extreme repression, some Uyghurs have indeed advocated separatism and utilized terrorism and violence, including street riots, as a means. 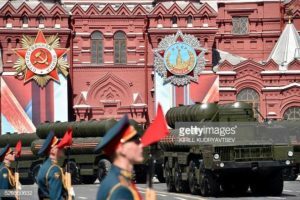 Russian S-400 air defence missile systems roll at Red Square during the Victory Day military parade in Moscow on May 9, 2016. This article is a slight revision of a talk given on March 13, 2019, in New York City. Thanks very much for the invitation to speak today, and to all the members of the audience. I want to thank my good friend US Navy Captain James Fanell, who was Director of Intelligence for the US Pacific Fleet. He is not here, but he has been a mentor on the issues I’m covering, and assisted with comments to this presentation. The full presentation is a combination of material from a book I edited that was published last year by the U.S. Naval Institute Press with the title – Great Powers, Grand Strategies: the New Game in the SCS, and my next book, on the strategy of brinkmanship. This presentation, however, will focus on how China is innovating in the South China Sea on technological and strategic levels. In a short year since the book was published, the South China Sea conflict has heated up. On March 4 and March 7, 2019, USPACOM, which is the Asian equivalent of CENTCOM and for which I used to work, sent nuclear-capable B-52 bombers over the SCS, including one flight revealed today. USPACOM also recently revealed that China’s military activity in the SCS rose over the past year. China occupied a sand bar near the Philippines island of Pagasa, in the Philippine exclusive economic zone, or EEZ, and Chinese boats purposefully rammed and sunk a Vietnamese fishing boat in the Paracel Islands of the north west SCS, islands that both China and Vietnam claim. CPL Richard Hansen – 12th Special Forces Group (Airborne) collects his parachute after jumping from a C-130 in May 1987. 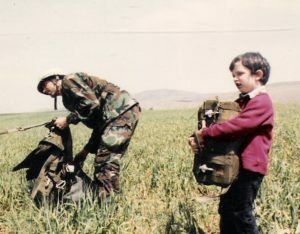 The author, Heath Hansen when four years old, holds his father’s reserve parachute. I looked up into the big, blue sky. Far in the distance, I spotted a C-130 Hercules headed towards the open grass field I waited upon. For a few moments, I watched as the plane continued in my direction; suddenly, from the tail-end of the aircraft, paratroopers jumped out into the open air. The parachutes expanded sideways as they became caught in the wind and fully inflated, pulling the soldiers swiftly with them. Dozens of troops poured out of the fuselage and descended to the ground. I saw the first jumper hit the grass and quickly sprinted to him.